Here's a great new online slots game from Iron Dog Studio that you can play. What’s your dream vacation like? 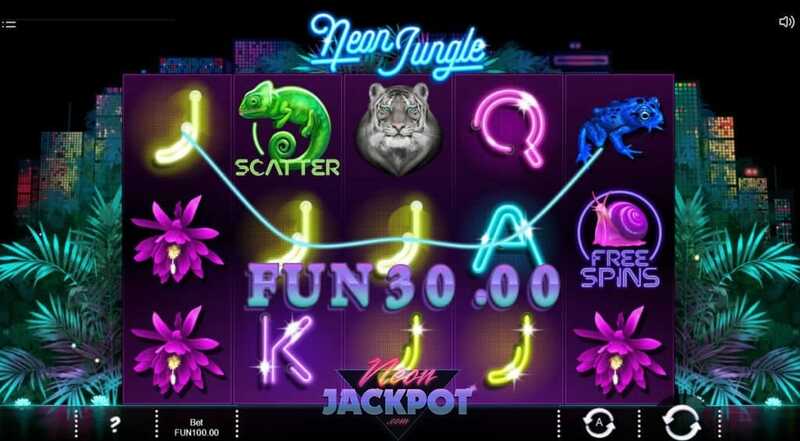 We bet it looks a lot like this Neon Jungle online slot game. Picture lush green forests, the cooing of birds, grunting of wild animals, jungles and everything resembling the tropics. The word ‘Neon’ hasn’t been misplaced here since the game’s theme emphasizes on bright lights. The creators have given the rainforest a colourful makeover with crisply done visuals and a backdrop of heavy drums. It’s a five-reel slots games with 20 paylines. You will be virtually transported to the outskirts of Rio, a hub where wildlife and nightlife mingle. Gamblers will appreciate this game’s unique bonus structure and its air of suspense. You won’t learn exactly what kind of bonus you may have activated until the final symbol falls into place. The stunning graphics and theme are the first things that will draw you in. Its tropical theme is probably something you’ve seen before, but not in this way. The developers have implemented a more creative and visually stunning aspect- bold colours, neon lights to highlight Brazilian nightlife with a background contrast of the green forest. If you have ever encountered games by Iron Dog Studio, you’ll know that these guys bank on stunning visuals and user experience. They’re not scared of experimenting with innovative features in their games and Neon Jungle is a testament to that. You’ll see a lot of their fearless nature in game development in this slot game as they step out and give it a dose of bold colour. If you love promo's, visit our slot promotions page today. The graphics have been captured beautifully in this game. If there’s ever a way you wanted to immerse yourself in aspects of Brazilian nightlife, this is it. The developers did a good job of incorporating a lot of colour here making the animals stand out. There are also a lot of catchy sound effects to go along with the game and give it some life. The objective of the game is simple. Players will need to match symbols across the paylines with at least three similar rows. This is essential to score a win. Collect smaller payouts by matching poker ranks from jacks to aces. To score high payouts look for various plant symbols and animals likely to be spotted in a tropical environment. Keep an eye out for frogs, parrots, butterflies, flowers and tigers. Tigers offer the biggest payouts out of all the normal symbols. Look out for the neon glow. Whenever it surrounds a particular symbol, you stand to gain the bonuses highlighted below. Wild symbol- The wild symbol is the monkey. You’ll need to keep an eye out for monkeys on the reels. They’ll substitute for any other prize icon to help complete your paylines. 4x multiplier- Quadruples the payout. Scatter- Neon scatter that awards players a 250-coin payout. Free Spins feature -Look for a neon glow surrounding a free spins symbol. It’ll earn you 6 free spins. Pink Flamingo- Lighting the flamingo will activate the Keno Light Bonus Feature that starts with a draw. The more numbers out of 10 that match, the bigger the potential prize. 50 coins is the starting rate, but players can score up to 20,000 if they can match a perfect 10. If you’re a fan of big and bright worlds, then you will appreciate the great visual contrasts in this game. You’re also going to love the special features. The bonus system adds an aspect of drama to every spin because it makes any icon important when it gets that special neon glow. It’s highly likely that you’ll enjoy this game so go ahead and give it a spin.